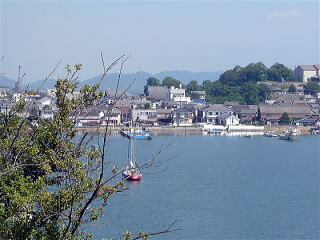 Tomonoura is a historic old harbor in Fukuyama City. While Tomonoura is a beautiful harbor, you can not moor your boat here at any pontoon nor any pier. See the X marks in the map below. 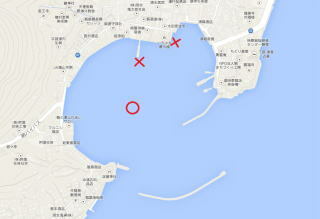 You can only ride at anchor around the center of the harbor, as you see the red circle in the map. 34 22.790N 133 23.000E is the point at the entrance of the harbor. Then proceed to the center of the harbor. Note: When I hoisted the anchor after riding at anchor, the anchor and the chain came up with a lot of bad-smelling sludge. I was afraid that the anchor had not caught the sea bed. It looked just sinking in the middle of the thick mud. As it was a calm day, my boat was not dragging. When you ride at anchor here, you will need a right anchor in this situation such as CQR. For your overnight mooring, I recommend you move to Sensuijima. Then, you may take a frequent tour boat service from there to here. There are some gas stations for fueling. Many toilets. The cleanest one is at the ferry pier. A big super market is near Tourist Information Center. As here is a sightseeing place, there are many restaurants.